Scientists said on Wednesday they had used stem cells to grow primitive human brain tissue for use in studying disorders and early development of this most complex of organs. They used the cells to grow what they dubbed "cerebral organoids" -- pea-sized blobs of 3D brain tissue in a Petri dish, with characteristics of early embryonic brain tissue. The feat may reduce scientists' reliance on the mouse brain, which is a poor model for research into human diseases and treatment, the team wrote in the journal Nature. "Development of the human brain is very different from development, for example, of the mouse brain," study coordinator Juergen Knoblich of the Austrian Academy of Sciences told a telephone press conference. The technology should help biologists study "human-specific" features of human brain development and disease, he said. It was also hoped the method would allow researchers to "test drugs directly in a human setting and thereby avoid animal experiments and get more informed results that are more easily transferrable to human patients," said Knoblich. Knoblich's team used pluripotent stem cells, which can be prompted to develop into any kind of cell of the body, to create neural cells that "self-organized" into organoids up to four millimetres (0.15 inches) big. They survived for several months in a spinning bioreactor. The 3D culture system... develops a variety of brain regions that are capable of influencing one another - said a summary of the study. "The tissues form in layers and display an organisation similar to the developing human brain at early stages." The neural cells were "active", according to Knoblich. "These structures are not just peculiar lab artefacts," said Oliver Bruestle of the University of Bonn's Life and Brain Centre in a comment on the study. 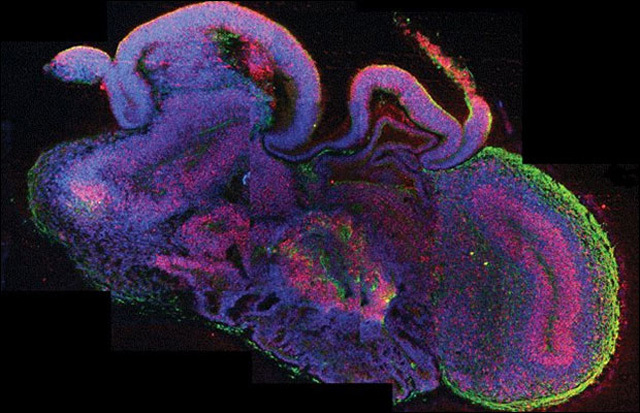 "The organoids recreate early steps in the formation of the human brain's cerebral cortex, and so lend themselves to studies of brain development and neurodevelopmental disorders." But despite the fascinating potential, he said the scientific dream of creating a "brain in a dish" remained out of reach. "Even then, their core represents a dead zone of cells starved of oxygen and nutrients," said Bruestle. Knoblich said the method was never meant to be used to grow replacement parts for a damaged human brain, and expressed doubt it could ever be used as such, given the organ's structural complexity.